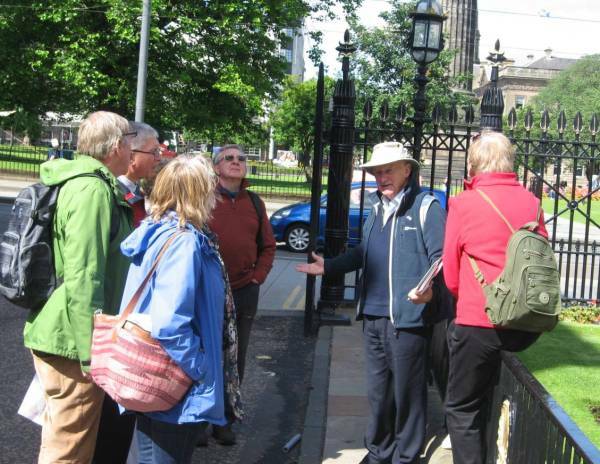 EFVGA - Walking tours of historic Edinburgh for your organisation, group or family. Let us organise a tour especially for your organisation, group or family. These custom tours are led by the same expert local guides who lead our highly-praised free Royal Mile tours during the Edinburgh International Festival and Fringe. We can arrange a walking tour for your group at any time of the year except during August (but we ask you to give us at least two weeks notice if at all possible). Choose from one of the suggested itineraries listed below, or ask us to plan a route that matches your specific interests. Although we will do our best to arrange your tour for the date that suits you best, this cannot always be guaranteed. It would help if you could give us at least two weeks notice and also if you could provide a choice of dates. Note that we do not offer these custom tours during August, but you are welcome to join one of our free Royal Mile tours during that month's Edinburgh Festival and Fringe. All tours cost £5 are per person (£2 for under-17s). There is no charge for primary or secondary school groups (including teachers and other accompanying adults) from within the City of Edinburgh. There are no hidden costs. Our guides are all volunteers who do not expect tips. The fees shown here all go towards the running of our association. Please contact us when you are ready to book a tour or if you have any questions. We are completely flexible in the tours that we offer. The following are our most popular routes, but we are happy to vary these to meet your personal preferences or to include any particular sites that you would like to visit. Tours usually last about two hours. The original burgh of Edinburgh, including the Edinburgh Castle Esplanade, Lawnmarket, Parliament Hall, City Chambers, Tron Kirk and John Knox House. The quieter eastern section of the Royal Mile (the old Canongate burgh), taking in Canongate Tolbooth, Canongate Kirk, the Scottish Parliament and the Palace of Holyroodhouse. Selected sites from the full length of the Royal Mile, from the castle at the top of the hill to the palace and the bottom. The Grassmarket is Edinburgh’s original marketplace and now, in the 21st century, one of the liveliest spots in the city. Greyfriars is one of the oldest churches in the city with many historic associations. Its adjacent kirk yard is the scene of the world-famous story of Greyfriars Bobby. The New Town (which in fact dates from the 18th Century) has some of the finest neo-classical and Georgian architecture in Britain and is considered a masterpiece of town planning. Our tour will show a selection of its many hundreds of historic buildings. © Copyright EFVGA 2017 - 19. All rights reserved.